I loooooooooooved these so much! I still have a couple of the tins, lol. I loved these too! I can still remember the cherry scent. I might still have one somewhere in an old suitcase, LOL. Wow, I don't remember these at all. Of course I wasn't really a lip gloss kind of gal. They look fun though, kinda wish I had been. YES!!!!! I loved these! Your posts always make me feel so happy! I had some of those. I loved them! yes! one of my sister's had this- the grape one. i always felt fancy when i was able to sneak it out of her makeup drawer and get a swipe at it. she also had another brand that looked like the same style, but it had a gypsy-type woman on the logo. I couldn't bring myself to use lip balm that had to be applied with your fingers. I don't remember these at all either. But for some funny reason your post reminded me of Bonnie Bell's baby soft fragrances. And yes I used them. OMG! I have been trying to remember the name of those for YEARS. Favorite. Best. Ever. Wish they would bring them back. Remember them? I think I got 23 cases of herpes from them! Yes, yes, yes! I had and loved all of them, especially the designs on the the cover. umm, totally!!! love these and always try to google to find out the name as I always forget!!! I loved these. Simple tin with two cool flavors per tin. The cherry was the best. I hope they bring these back!! I found your blog looking for these glosses as stocking stuffers for my daughter and nieces! I wish I could find some!!!! I Loved Them! I had what felt like a million of those! What memories! These tins, for me, evoke more memories than you can imagine. I had to blog about it! I used to keep them in the case with my barbies. I can still remember what they smelled like. 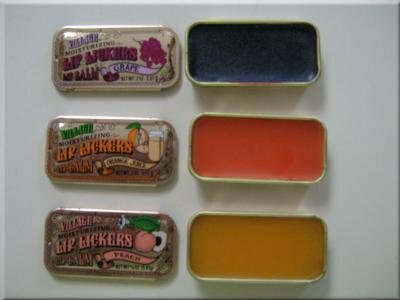 I loved Lip Lickers. Had lots of flavors and was always sad when they were gone. Wish they were still around. I would buy them in bulk! I traded them in for Carmex when I got a little older. Thanks for the trip down memory lane! I loved these too, and had many flavors. There is a company that makes similar balms in tins. They are Vintage Sister at vintagesister.com. They are almost as awesome as the original! My big sister(high schooler) had many & in larger sized tins. I did have one(bubblegum i think) & it did get a bit grimy after a few finger dippins.The tins were lovely & ive often wishd i still had one. Just found your blog. I was a child of the 80's too. Born in Minneapolis in 1974. Thanks for the great memories! I miss my Jordache purse. love love love them I wish they still made them! I totally remember these. ROSEBUD PERFUME COMPANY MAKES THE next best thing for today. I had to buy juat because they reminded me of the Tim's from the 80s. The Rosebud brand today comes in a round tin with the olden days type writing. I got strawberry. Just bought it because of the childhood memories.